After a long, grey winter, there’s nothing like stepping outside on a 70-degree day and feeling the sun on your face. Then the weather warms up and the sun stops feeling as welcoming. Being outside gets to be hard on you and hard on your skin. But it doesn’t have to feel that way. Here are a few summer skin care safety tips to help you keep your skin happy and healthy this year. Sunscreen. It’s at the top of every summer skin care safety tips list. And for good reason. Sun exposure can lead to skin damage in the form of wrinkles, fine lines, dark spots and patches, to say nothing of more serious health concerns. If you go out, sunscreen is the most important form of skin protection you can use. Choose a broad-spectrum sunscreen – SPF 30 or greater – that offers UVA and UVV protection. Make sure you’re using enough sunscreen, about an ounce at a time to cover all exposed areas. Apply sunscreen 15-30 minutes before heading outdoors, and be sure to reapply it throughout the day, particularly if you’re swimming or working up a sweat. Finally, remember that your lips need sun protection too. Keep them soft, smooth and safe by applying a rich balm with SPF 15 or higher. Let’s say you forgot your sunscreen, or just didn’t wear enough. Ease the pain of a fresh sunburn by applying soothing botanicals and cooling gels, which will prevent peeling, keep redness to a minimum and reduce inflammation. Remember that sunburns can increase your risk for melanoma. Be sure to have your doctor conduct a yearly skin exam and perform your own check each month to look for carcinomas and melanomas. Vitamin C gives us healthy collagen, the tissue that makes our skin strong and healthy. Citrus fruits like oranges, grapefruits and lemons are an obvious source of vitamin C, but you’ll also find it in strawberries, blueberries and raspberries, along with several vegetables, including squash and broccoli, kale, spinach and other leafy greens. Cantaloupe might be the best fruit to eat for healthy summer skin. It’s full of antioxidants, hydrates the skin and is another source of vitamin C. Be sure to read our previous blog post to learn about more foods for a healthier skin. 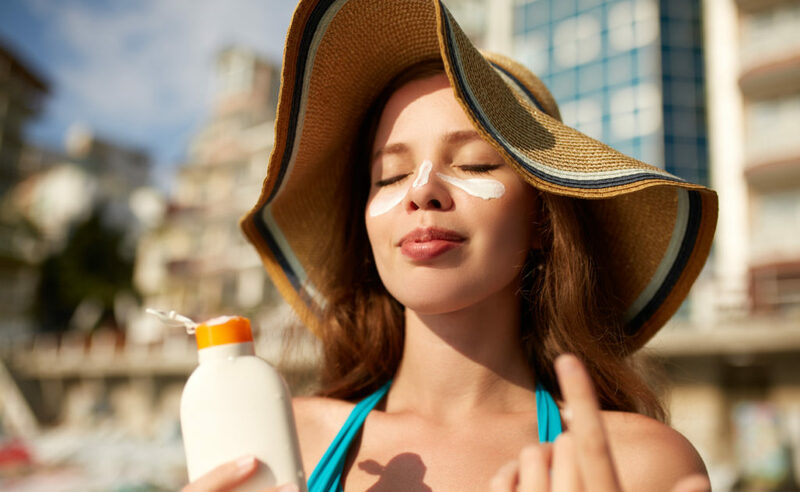 Perhaps the strongest defense against sun damage is avoiding the sun when it’s at its brightest – typically between 10 a.m. and 2 p.m. If you have to be outside, follow our sunscreen suggestion above, and put on sun-protective clothing, which carries the label UPF (ultraviolet protection factor). Wearing a wide-brim hat will keep the sun out of your face. A baseball cap can’t protect against sun coming in at an angle. When we exfoliate, we remove skin debris and improve on the hydrating effects of moisturizers and toners. Exfoliate in the morning before applying make-up, toner, moisturizer or sunscreen. Summertime heat can make us dehydrated, leading to headaches and dizziness. Sticking to the 8-glasses-of-water a day rule helps keep your skin moisturized and works to detoxify your body. And if you drink coffee or other caffeinated beverages, you’ll need to add even more water to your diet to help rehydrate yourself. Wearing an intensive skin masque once or twice a week can help keep your skin hydrated. So will a cool shower. Getting a hot shower after being out in the sun will dry out your skin even more. In addition to all these summer skin care safety tips, we’ll recommend one more method for keeping your skin healthy this year: scheduling a facial, which can help clear your pores and give you smoother, more supple skin after harsh sun exposure. If you’re looking to get a facial in Philadelphia, contact Body Restoration. Our spa in Center City offers facials that include exfoliation, deep cleansing and a custom skin analysis. Whether you’re treating yourself to a 75-minute session or the standard hour-long facial, we’ll help you greet the summer with happier, healthier skin.